Missing Word Solutions Principal Greg Thompson worked with Dart Transit on the development of a special podcast series focused on the many efforts the trucking industry is making to support the fight to prevent and stop human trafficking. We have featured the press release Dart issued along with the five-part podcast series. The series has received national attention from trucking industry media coverage. Dart Transit, one of America’s leading nationwide transportation service providers with over 80 years of experience, highlighted the company’s continued support of the Truckers Against Trafficking organization by announcing the release of a special podcast series detailing the efforts of the trucking industry to combat human trafficking. Produced in collaboration with Truckers Against Trafficking (TAT), the Minnesota Trucking Association (MTA) and the Minnesota Bureau of Criminal Apprehension (MBCA), the five-part series examines how the state of Minnesota and MTA members have been involved in the effort to address human trafficking. Available on iTunes and SoundCloud.com, Dart’s newest podcast series spotlights the work of Minnesota Senator Amy Klobuchar, who introduced the Combatting Human Trafficking In Vehicles Act during an MTA-sponsored event at Dart last summer. 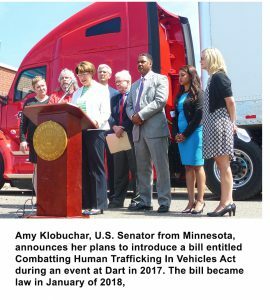 Senator Klobuchar’s bill, which is designed in part to provide additional resources for training of professional drivers who can serve as the first line of defense against human trafficking, received overwhelming bipartisan support during 2017 and was signed into law in early January of 2018. Dart recently reached the milestone of having a total of 500 company drivers and owner-operators driving within the Dart Network fleet who have become certified within TAT’s training. TAT has established a well-respected program which is designed to assist professional drivers in identifying and reporting suspected instances of human trafficking. In part one of the podcast series, Minnesota Trucking Association President John Hausladen discusses MTA’s role as a host of an event this past spring for a coalition of organizations involved in a Briefing on Commercial Sexual Exploitation, and MTA’s involvement in such efforts. During the spring coalition gathering in St. Paul, MTA member carriers from across the state participated in the event, which outlined the heart-wrenching issues related to human trafficking and, once again, underscored the importance of situational awareness and the value of training. MTA is joined in this coalition effort by TAT, the MBCA and the NATSO Foundation. Esther Goetsch, the Coalition Build Specialist for TAT, and Drew Evans, a Superintendent with the Minnesota Bureau of Criminal Apprehension, also appear in segments during the Human Trafficking Series on the Dart Network Podcast. Both Goetsch and Evans discuss the vital role that all professional drivers can play in combatting human trafficking by being observant and by reporting any situation that looks like it could be related to human trafficking.